She was without a doubt larger than life, and by all accounts, one of the kindest, most generous people in the business, as well as one of the biggest stars of the past century of entertainment. 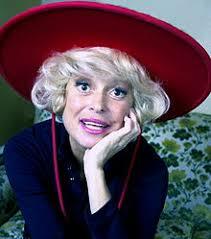 Carol Channing passed away early Tuesday at her home in Rancho Mirage, California at the age of 97. Although Channing had a presence on television and in the movies throughout her career, earning an Oscar nomination for 1967’s “Thoroughly Modern Millie“, it was the stage she was best known for, originating the role of the diamond loving Lorelei Lee in “Gentlemen Prefer Blondes” and the title role in the long-running smash “Hello Dolly“, for which she won a Tony Award.